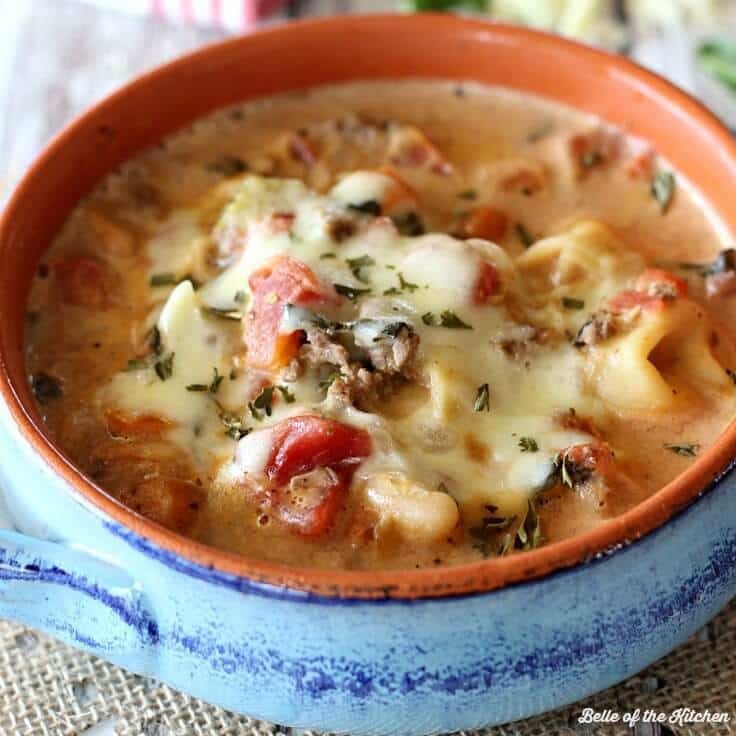 This Creamy Tortellini Fagioli Soup is a hearty and delicious recipe full of meat, veggies, beans, and cheesy tortellini, all swimming in a creamy broth. 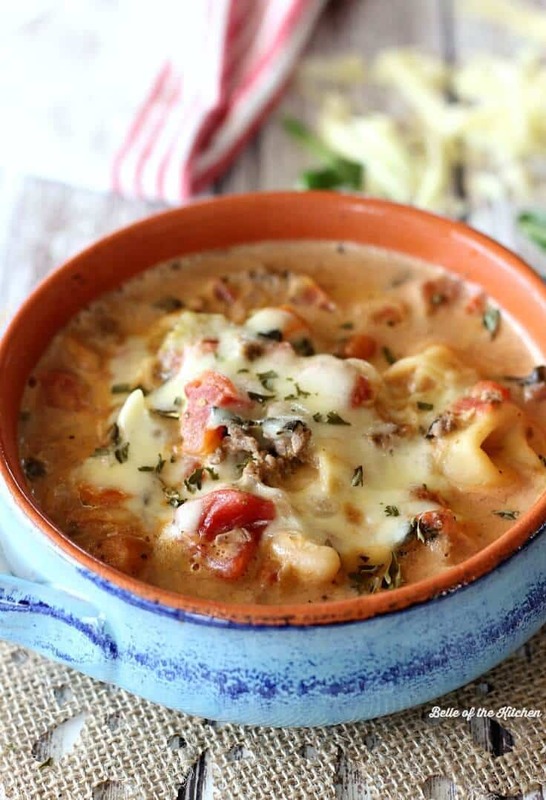 This creamy Tortellini Fagioli soup is about to become a staple in your dinner menu. Learn how to make it in the slow cooker and on the stovetop, both are super simple! 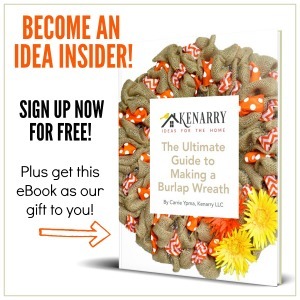 Happy November, Kenarry readers! I’m Ashlyn from Belle of the Kitchen and I’m excited to be back here Ideas for the Kitchen, a blog series where Carrie and I swap recipes once a month. 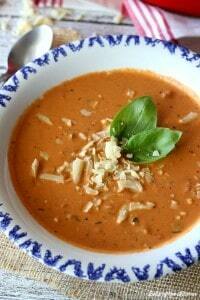 For November, we decided to revisit last year’s theme of soup recipes. Those soups have been two of the most popular recipes on our blogs, so we wanted to give y’all some new and equally delicious recipes again! 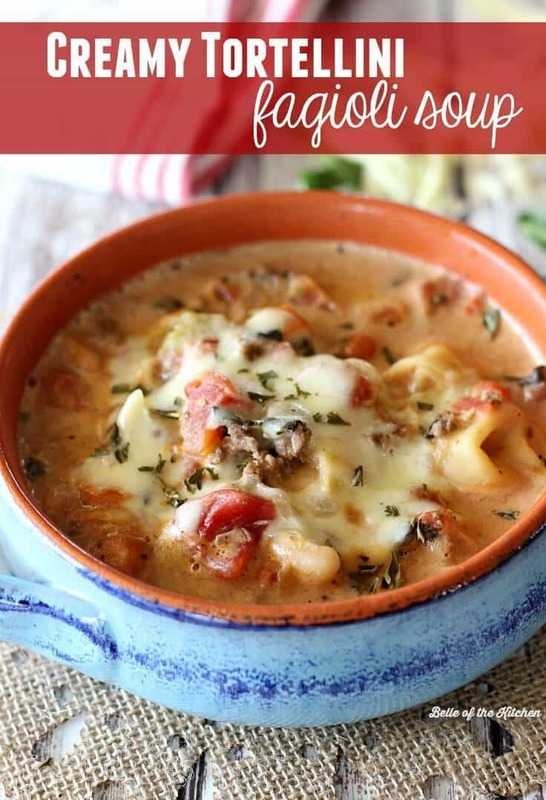 Have you ever had Pasta e Fagioli before? It translates to “pasta and beans” and is a really delicious Italian soup that has roots as a peasant dish, since it was comprised of mainly inexpensive ingredients. I love ordering it when we go out to eat, and have also enjoyed making it at home with my own probably-not-so-authentic modifications! I actually have a very good friend who is from Italy and I have loved talking to her about food. Funny story: the first time we had them over for dinner, I wasn’t thinking straight and made my Americanized lasagna for them. I realized about 30 minutes before they were supposed to arrive that I was making lasagna for a true-blue Italian, but by that time it was too late to turn back! She was super sweet about it and even gave me compliments on it, but I still felt silly. Especially after we had dinner at their house for the first time and I was lucky enough to eat a meal made with both pasta and cheese mailed directly from her family back in Italy! We are still good friends even though her and her family recently moved back to the mainland. I miss her a lot and I know our kids miss each other, too. That’s one of the hard parts about being an army spouse; you make some incredible friends but there is always a limit on how much time you will have with them, and it’s never ever enough! Even though she isn’t around to help me out with my Italian cooking, I’d have to say that this soup is pretty delicious! I decided to make it with tortellini since it is one of my family’s favorite pastas, and I also used some ground beef to make it even heartier. 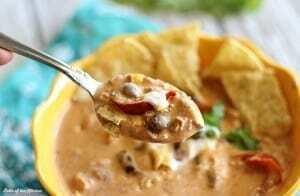 Next time I make it, I plan to use ground Italian sausage because I think that would taste amazing! Add everything except the tortellini and spinach to the slow cooker. Cook on low for 4-6 hours. In the last 10 minutes of cooking, add the tortellini and spinach. 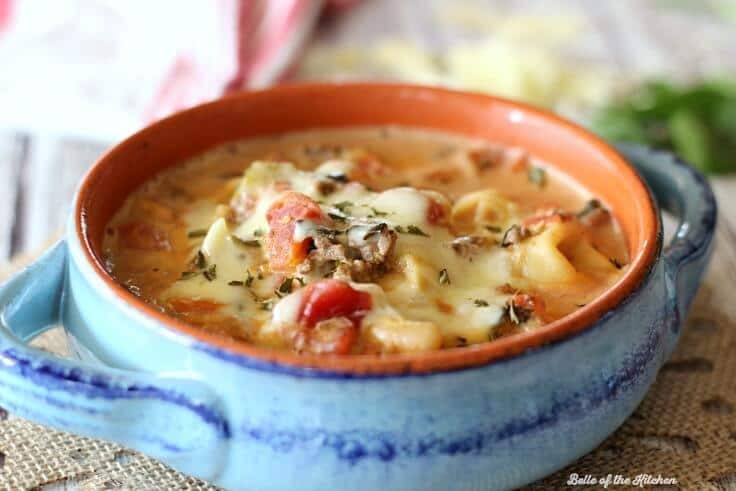 Do you have a favorite soup recipe that keeps you warm when the weather changes? Share your ideas with us below! Plus, be sure to check out our SUPER popular recipes from last November, including Carrie’s Slow Cooker Loaded Potato Soup and my Crockpot Cheeseburger Soup! Here is a printable recipe card. Don’t forget to pin this post so you can find it later! In a large soup pot, brown ground beef with green pepper, onion, carrots, and garlic. Drain fat and return pot to the stove. Add in the chicken broth and tomatoes and bring to a boil. Reduce heat, add the cream cheese and simmer covered for 10 minutes, stirring occasionally. Add in the tortellini and simmer for 5 minutes. Add in the beans and spinach, and season to taste with salt and pepper. Cook for an additional 1-2 minutes, or until spinach is wilted. Enjoy! Originally published November 2015. Updated November 2018.